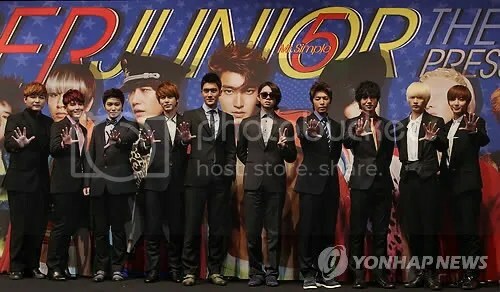 SNSD and Super Junior will be making an appearance on KBS‘s ‘Love Request‘ on September 17th. Through the show, these groups will be inviting an 11-year-old Cambodian girl, Suraili, who has a heart condition, and a young Indian* boy named Nurulee, who lost his eyesight suddenly at the age of 9. These children will fly to Korea to receive treatment. In addition, the idol groups will also be on site to participate in a blood drive campaign. SPAO, a Korean fashion brand, has recently released its Spring/Summer 2011 clothing line. For quite some time now, the company has chosen representatives from SM Entertainment groups to model for the company. Members from both Super Junior (Heechul, Leeteuk, and Siwon) and SNSD (Yoona, Yuri, Sooyoung, and Seohyun) were selected for this round and SPAO was able to reveal its diverse and fashionable line for the upcoming seasons. In the CF, SPAO shows off its many different types of jeans, ‘Star Jeans’. Siwon wore ‘Skinny’, Heechul wore ‘Slim Baggy’, Seohyun wore ‘Skinny Straight’, Yuri wore ‘Jeggings’, Sooyoung and Eunhyuk wore ‘Slim Straight’, and Yoona wore ‘Skinny Tapered’. Because of their fit bodies and perfectly-proportioned figures, each model successfully commercialized the products. Also, through their website and their Twitter account, SPAO released ‘couple’ pictures of SNSD and Super Junior in the SPAO outfits. The couples, which included Siwon-Yoona and Heechul-Yuri, sported checkered outfits that gave off the cool feel of the spring. Super Junior Leeteuk said to Girl’s Generation Jessica “It’d be good if you read some books”, humiliating statement attracted huge laughter. On the 11th broadcast of , a student made an appearance as someone whose able to read a book in a span of 2-3 minutes, and shocked everyone. After which (,) Leeteuk said to Jessica “It’d be good if you read some books”, this sentence turned the shooting scene into a laughing ocean. The flustered Jessica then explained “I like books.” which could not be of much help (in actual fact). In regards to Kang Ho Dong’s question “Out of all the books you read, what’s the one which left the greatest impression on you?”, Jessica replied “The books i read are all foreign books.” However being unable to continue (,) she said (and tried changing the topic) “Ah, it’s so hot.” Using her aegyo to resolve the situation, again making everyone burst into laughter. Super Junior Eunhyuk exposed the past of Girls’ Generation member Yuri. On the 28th Nov broadcast of KBS2 TV , Eunhyuk made an appearance as a guest MC, and revealed “There was a vast difference between my first impression of Girls’ Generation Yuri and her current image of . When I first saw her, she was still a child who imitates dinosaur.” Eunhyuk said “Every week (,) there’ll be an individual skills test of our singing and dance ability, Yuri really performed the imitation of dinosaurs, and also including the famous song then in an advertisement, Jeon Ji Hyun’s .” In regards to this, Yuri then performed a funny version of Jeon Ji Hyun’s on the spot, attracting huge laughter from everyone in the studio. That day, Eunhyuk even picked on Girls’ Generation Yuri and said “In the past, Yuri was like now, elegant and quiet, and had not much friends.” making Yuri humiliated.